A Cawker City woman missing since Sunday’s blizzard was found dead. 37-year-old Tanya Eshbaugh was supposed to report to work on Monday, but did not show up. Her abandoned vehicle was found on Highway 24 in Mitchell County. It is believed that after getting her vehicle stuck in the ditch due to blizzard conditions she exited the vehicle. Authorities confirmed they found her body about three miles from the vehicle. ORIGINAL: Authorities are searching for a Cawker City woman who is missing after trying to drive to work on Monday. 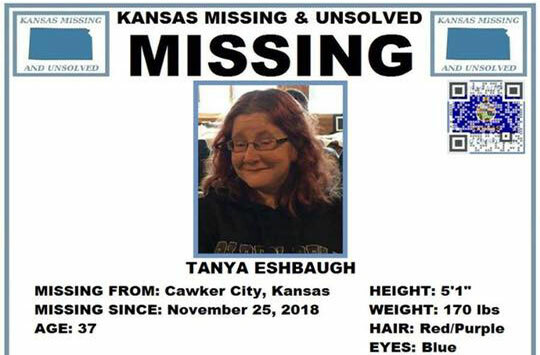 According to Kansas Missing and Unsolved, 37-year-old Tanya Eshbaugh was supposed to report to work on Monday, November 26 but did not show up. She called in to say that she was not going to make it due to the weather and was turning around to go home. Tanya’s vehicle was found on Highway24 and Mile post 204, in Mitchell County. It is believed that after getting her vehicle stuck in the ditch due to blizzard conditions – that she exited the vehicle and her direction of travel is unknown.